Challenge #02257-F067: Terrans of the DeepsteemCreated with Sketch. Human talk about their oceans flora and fauna and deep water creatures. Humans love to explore. To them, nothing is more alluring than the path not taken, the nook unchecked, or the depths undelved. There is no length a Human will not go to in order to see what's there just because they can. It should therefore surprise few that, once exploring a new world, they will bring their light and curiosity to the deepest, darkest depths. Especially if those depths are underwater. They've spent centuries developing technology that would give them access to places they otherwise couldn't go. Including the depths of their neighbouring gas giants. It should not have been a surprise to see Human Jan using the Bulk Fabricator to print a high-pressure exploratory vessel, replete with Sonar HUD technology that would turn the windows into displays where, in Human Jan's words, the people within would be able to 'see like a dolphin'. "Why?" Kikroth demanded. "There is very little below the light layer. No plants or plant-like life can exist without sunshine. Therefore, there's nothing for anything else to live off." Human Jan just grinned as ze played with hir data reader. "That's what we thought, too, but then we discovered deep smokers, and the bioluminescent creatures of the trenches." Ze took in a deep breath, eyes alight with the eagerness to share an infodump. "It's amazing really. Life is so tenacious. You'd think the deepest, darkest parts of the ocean would be empty, but you got swarms of bottom-feeders and things that'll eat the bottom-feeders, and things that eat those things. Look. This is a deep sea smoker. A little underwater volcano pumping out minerals and super-heated water." The picture was disturbing to say the least. Bone white cylinders with what appeared to be blood-red flowers at their tops. Pale crabs swarming the area. Black smoke issuing forth from the chimneys of the 'smoker'. Fish in abundance, swimming casually around an underwater volcano as if they did it every day. This was a picture from the well-named Terra. They probably did. "And this little beauty is a deep-sea angler-fish." Only a deathworlder would call a creature like that a 'beauty'. It was all teeth and hideous adaptations to the depths. No eyes remained in the blank sockets, and it held a single bulb of bioluminescence on the end of an antenna on what could charitably be called its face. "There's all kinds of bioluminescent jellyfish. Oh! Wait 'till you see the Vampire Squid..."
"I would much rather wait," Kikroth allowed. "Those creatures are terrifying. Why would you seek them out?" "Because we can learn so much about how evolution happened. Because they're so interesting. Because..." Human Jan shrugged. "Because they're there." Which was, when you got down to it, the chief reason why Humans did anything at all, really. Also known to the knowledgeable as the 'Inhale of Doom'. That footnote killed me, “Inhale of Doom” is such a perfect description of the breath one takes before they infodump. It’s wonderful! I heartily endorse it being used as an official term. on what could charitably be called its face. 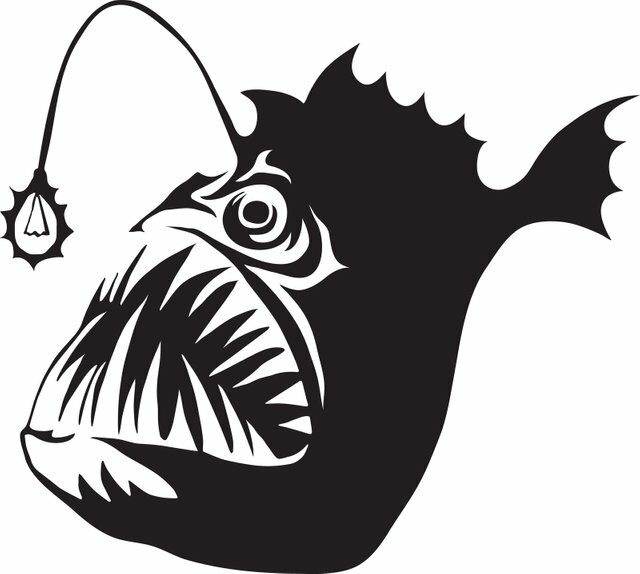 We know (and some of us love) the deep sea anglerfish as a face(?) few could adore. I mean, it's like 90% teeth over there. They mean business when it comes to 'eat or be eaten'. Nevertheless I do love the ugly mofos.